Destination weddings are so inspiring and magical. As a destination wedding photographer, around every corner and over every horizon, the setting just sparkles with newness and discovery — and so do the couples! Casa Kimball in Cabrera, Dominican Republic is a spectacular destination for your nuptials. The private luxury villa overlooking the Atlantic Ocean is the utmost in romantically modern tranquility. Set on three acres and surrounded by almond trees, palms and native Dominican plants, the casa features minimalist contemporary design and décor and a host of deluxe amenities. It truly sets the scene for an intimate ceremony with close friends and family, as well as a perfect honeymoon spot. What a pleasure it was to photograph a wedding in this magnificent place and in such a beautiful part of the world. At every wedding I photograph, I am always looking for those wonderful moments that showcase the spirit of the day, while also taking in the details of the venue and its surroundings. 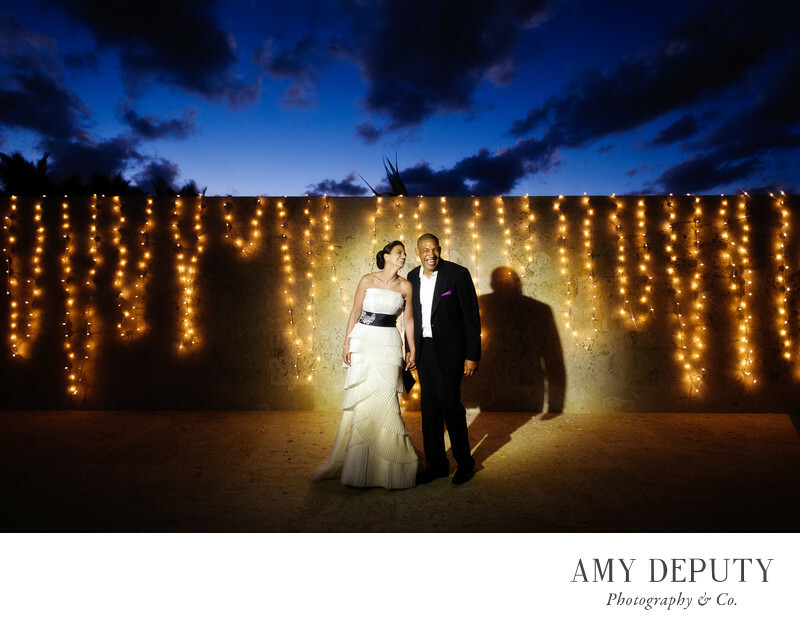 While the villa’s location offers a beautiful ocean view, this particular night shot is all about the newly married couple. The expressions on their faces show so much joy and playfulness. They are having the time of their lives. The bright blue sky lit by the last rays of sun, the golden strings of lights, and the halo created by the flash all enhance the glow of the bride and groom. The result is a moment that is radiant, dramatic, and fun. Location: Casa Kimball, 5-6, Cabrera 33000, Dominican Republic.